Every year, the students and classes taking part in the blogging challenge also try to join this special event held in March annually. Here is a link explaining why we celebrate Earth Hour and how it has progressed since the first one held in Australia in 2007. Many countries are holding different themes this year – check them out here. Switch off your lights for at least an hour starting at 8.30pm on Saturday night. Write a post about what you did in that hour as a family – did you keep your lights off longer than an hour? What thing related to climate change would you like to see fixed by all countries around the world by the time you are 50 years old? What could you do to help make that fix? Add the Earth Hour badge to your blog – right click on my image and save to your computer. Add to your sidebar using an image widget or add to a post using Add media. Here is my post on this week. I hope you like it. I really like this video. I will take into consideration some of the things listed to do to help our earth. 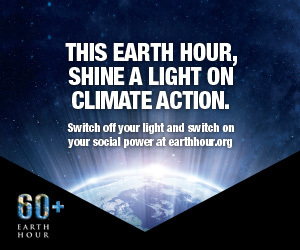 I will turn off more lights in my home contribute to Earth Hour. I know a lot of people don’t think of the little things that can make a difference in this world and it’s nice to have this reminder. I have never heard of Earth Hour though. I participate on Earth Day. I’ll have to think of more things besides turning off the lights that could help the Earth out. It’s also cool that Australia started this! I really like that video. good job. I didn’t even know that existed! I’m deffinitly turned off my lights after hearing about this. And not only did I save some energy but, I saved money to! I really like that video Mr.Geiman. Oups sorry! I am Bethany Online. I hadn’t even heard about it before I did this post, but I love the video and the concept is amazing. I do believe in it. I asked my parents if they knew about it, expecting that they didn’t, but everyone knew about it! This concept is such a good one and I think it is very true. I was wondering if you had any suggestions for my blog, as I am always looking to make it better. In Hamilton we have the Zulu night glow hot air balloon festival at the same time as the Australian earth hour challenge so I posted about how my family walked there and wached this event while leaving the house lights off for at least an hour. Are all the students doing the same event or the one for there country? If students wanted to check out what their country was doing, they could write about that instead. Otherwise the one for Australia sounded great with lots of choices. One question, did a student come up with earth hour? I am not sure who first thought of Earth Hour, but I know it started in Australia. You might find the answer to your question on the earth hour website.